Well, I have to admit, I watched the whole Super Bowl; it was the first football game that I have watched all season. 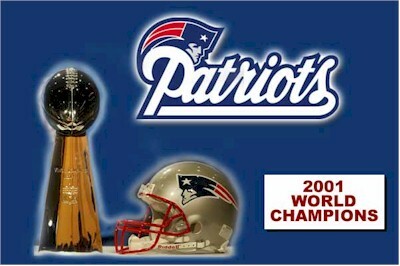 It was nice to see the Patriots win one, finally, after being rather embarrassed in their past appearances. I also have to admit that I like the new Pepsi commercials. As I was watching the game and commercials, I was updating this website. As you know, if you've been checking here during 2002, I've been neglecting the site in favor of other pursuits during January. The longer I neglected it, the bigger the "catching up" task became. Fortunately, this game provided me with a nice 3-4 hour period of sitting still in front of the computer (and TV). The day wasn't all sloth and radiation from screens, however. Matt and I jogged over to the YMCA for a nice workout in the early afternoon, right before the game started.